The ST-2 is the original KWCABS design. 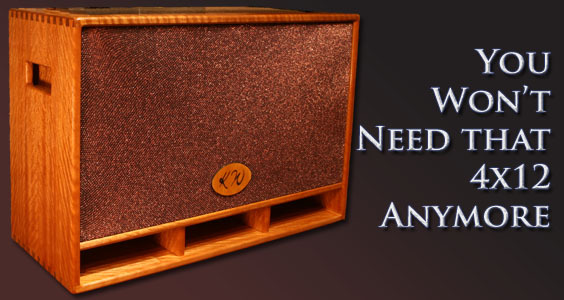 We set out with a simple goal: to create the best made, best sounding 2x12 available, period! The sound is immense! For a 2x12 they rival any 4x12 on the market for full sound. The ST-2 line comes in two trim levels the V and the M. The V (Vintage) excels in Jazz, Blues, and Rock; however it well suits any style of music. It features three medium size ports and like all KW Cabs a partly removable back. Closed it provides warm tight bass with crisp highs and very smooth mid-tones. Open the bass rounds off a bit and provides sparkling highs and super-smooth overall tone. The M (Modern) features 4 ports, which yield an ever so slightly tighter bottom end; lending it to those who also prefer heavy rock or metal. Regardless of which model you choose you'll be greeted with incredible tone and features second to none.